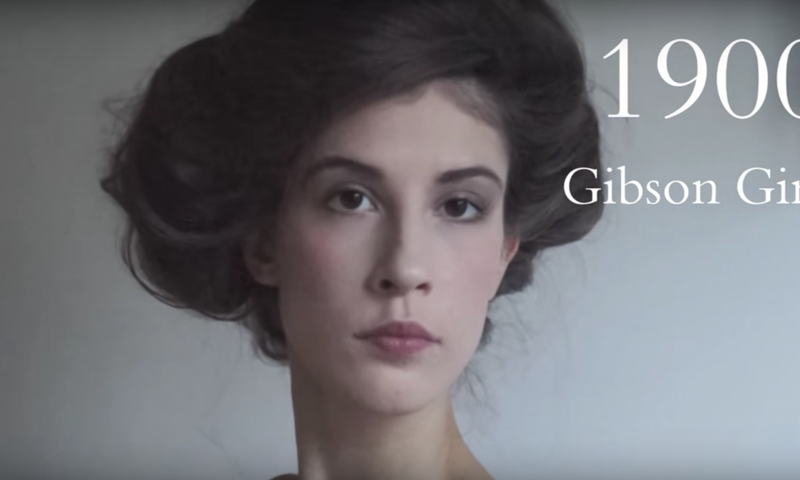 Karolina Zebrowska became a Youtube sensation in 2015 with her hugely-successful video ‘Real Women – Beauty Through the Decades’ that conveyed a simple but powerful message on how we view the past. In just two minutes she debunked the popular idea that past decades were always glamorous – with vintage enthusiasts choosing to focus on the fortunate elite – and used basic statistics to show what the average woman was doing whether it was serving the Edwardian elite or working in factories. We spoke to Zebrowska about internet fame, the costume scene in Poland and her next myths to debunk. How do you think three years and three million views has affected you? It obviously affected my channel hugely. I didn’t really think of posting videos regularly at that time but after a while I realised there were people waiting for me to post something. I couldn’t really decide whether to make videos in English or Polish and what should the videos be about – so that took me a while! But about a year later I started producing videos quite regularly. When I was making the video I remember thinking to myself: “Hm, this has a fair chance to become viral.” But obviously I didn’t expect it to happen. You never know with social media, especially with YouTube – it’s pretty much completely random. Who is your target audience? Do you see yourself as more ‘vintage blogger’ or ‘historical costumer’ and what is the difference? I see myself as neither of these and a bit of both. I tend to make my costumes using historically inaccurate fabrics and elements so I’m definitely not a proper “reenactor”. On the other side, I use primarily modern second-hand clothes to create my vintage style so I’m not a typical vintage girl either! I think historical costuming is an area that is still not explored properly – people are still very much surprised when they see my photos in historical costume – whereas vintage style is more common these days. People try it out for parties and see celebrities introducing vintage elements to their style. Also vintage bloggers seem more social media active while historical costumers just enjoy re-enactments and events and rarely post pictures. Obviously there are exceptions, but I think I can name a lot more vintage style Instagram stars than costumers. Do you sustain much income from Youtube? The trouble with YouTube is that the income is not steady. There are months when some random algorithms bring new viewers to my channel and I make more than usual and then there are months when I don’t even get the payout because I didn’t reach the minimum. If you want to treat YouTube as a job then you need to reach the level where it gets more predictable. You don’t want to be in a place where you can’t pay the rent because your latest video did poorly. What are the downsides of Youtube fame? Your genius ‘nudes’ link must have been inspired by something. That was just a totally random joke that I kept adding ever since. I did receive some very odd messages though and had one guy email me for over a year, even though I never replied. Surprisingly those situations are rare. A much bigger problem would be the negative comments – and I’ve noticed the more subscribers and views I have the more nasty people get. 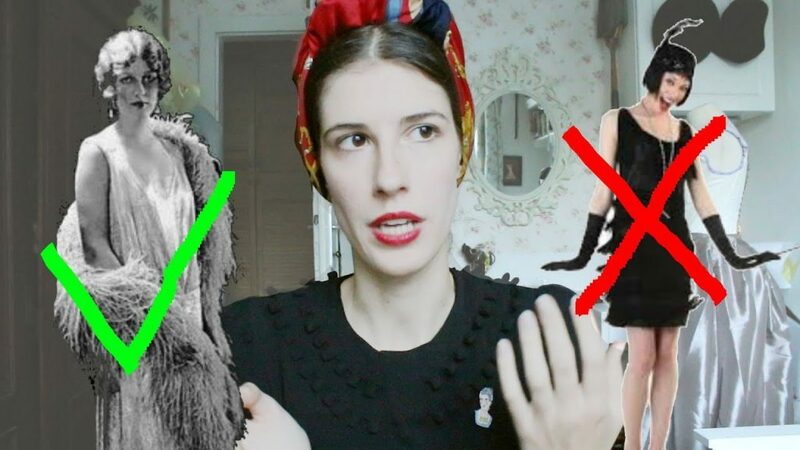 What’s funny is I’ve noticed usually my vintage-themed videos get a lot more hate than my historical ones (pre-1920s) – I think that’s because people don’t know that much about fashion history so they can’t really argue with what I say. When I talk about vintage style, I often share my personal views on things that are more relatable to everyone and people tend to disagree with me more. And when they disagree they can be quite nasty and pick on stuff I do or the way I behave just to prove their point. Also whenever I make videos on fashion history there are tons of people trying to prove me wrong. They always recommend sources I’ve already known and books I’ve already read, which is quite frustrating! What is vintage clothing and costuming like in Poland? Both communities are quite young here in Poland. The re-enactment scene has only started in 1990s, and the costuming community was practically non-existent until a couple of years ago. Not to brag or anything but together with my friends we started the first costuming society in Poland that now has over 50 members. The vintage community grows slowly from a strictly pin-up community. More and more people that were into pin-up discover more authentic styles and clothing. 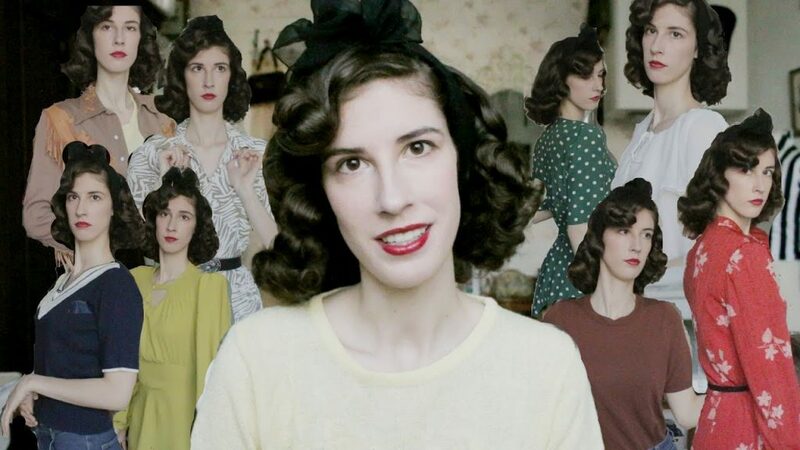 I think it’s great and I don’t mind pin-up style but it’s amazing to see people become more interested in history by watching old films to get the inspiration, listening to old music and slowly growing their authentic vintage clothes collection. It’s growing quite fast. 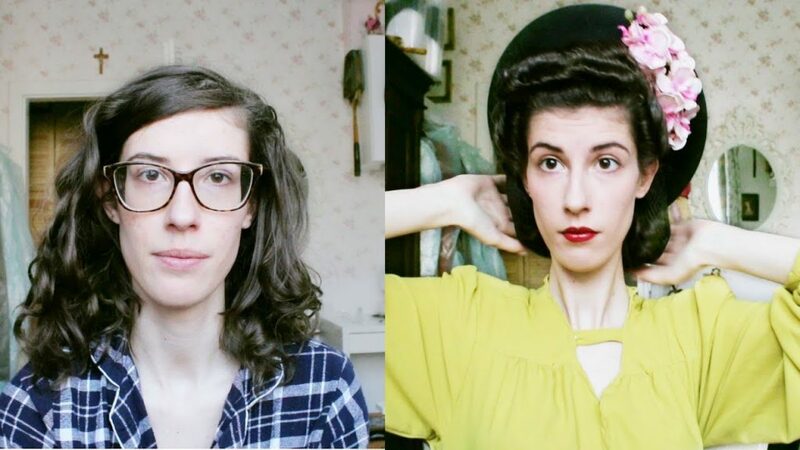 I’ve noticed a lot of girls are trying out vintage hairstyling and I know it’s boring to say it continuously as I do, but it really adds a lot to the whole look. Same thing goes for costuming actually. Obviously if you go out in fully authentic 1940s attire it is still going to raise eyebrows, mostly because people have never seen anything like it before, but I’m working hard to change that. The more stylish and unusual people there are on the streets then the more normal it becomes. You focus on costume ‘myths’ like modern “1920s” flapper style and real women’s work. Are there many other big ones you would like to tackle? There is one thing that bothers me recently, but I don’t think I’m brave enough to make a video on it as it may be perceived as controversial – and it’s implementing modern mindsets in period dramas. Especially women hating corsets and perceiving it as a form of oppression. I’ve seen so many female characters protesting “do I really have to wear it”, “I can’t wait to get it off”, and maids saying “We need to get it tighter!”. It’s such an awful stereotype. They would wear their corsets gladly and for their own comfort, just as nowadays most women choose to wear bras. Also I’ve noticed most female characters in period dramas are very unhappy with their situation and deeply hurt by society. And as controversial as it may sound most women in Victorian era, especially in the earlier decades, didn’t even know they were oppressed. They were taught from a very young age to follow social norms and conventions blindly. That’s what made suffragettes so special and that’s what made female artists who spoke about it openly so special. The suffragette movement wasn’t only about convincing men that women deserve freedom – it was also about convincing other women to wake up and join them. Also, though formally and socially you were expected to obey your husband at all times, there are tons of stories of women outsmarting their husbands and making them rely on their wives completely. Not every woman in Victorian era was a sad, helpless butterfly as portrayed in the modern movies.